Vusi Mahlasela has serenaded listeners around the world. Known as “The Voice,” he’s performed at the World Cup and Nelson Mandela’s inauguration, and shared stages with Dave Matthews Band, Sting, Paul Simon and Josh Groban. Hiland Mountain Correctional Center isn’t his typical venue. That doesn’t matter, Mahlasela said. “Wherever that spirit sends me, it is for a purpose,” he said, standing in the gym at the Eagle River prison Oct. 11. 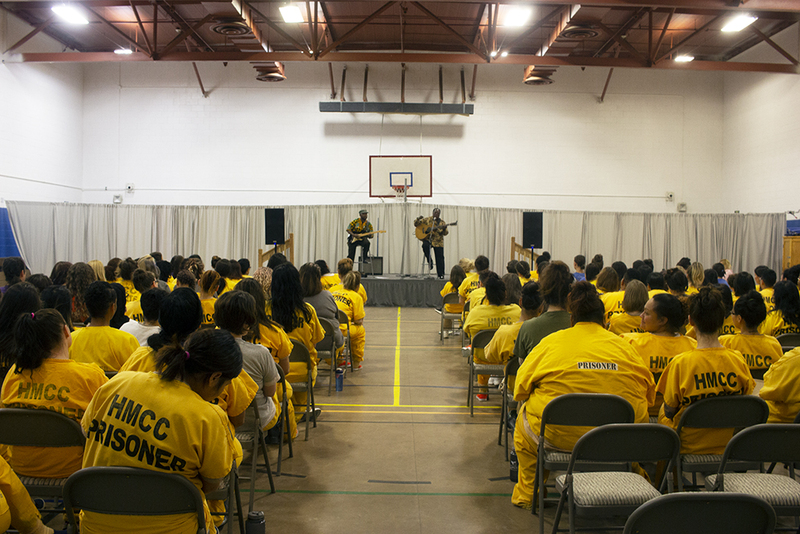 Mahlasela spent the middle part of the month touring Alaska as part of his Township Tour, but before he performed at the Alaska Center for the Performing Arts or sang for audiences in Cordova, Haines, Skagway or Juneau, he hosted a special show for inmates at Hiland. From a portable stage set up in the middle of the gym floor, he performed for an audience dressed in matching yellow pants and shirts. He sang songs about his home in the Mamelodi Township, sometimes pausing to speak about the history of the music or offer words of advice. “If you don’t forgive, you become like your own prisoner. You become like a bitter leaf that can just be squashed or stripped away any time — so forgiveness is very important, and we should all wear it like a crown,” Mahlasela told the crowd, who whooped and applauded in response. The Anchorage Concert Association worked with the Department of Corrections to arrange the event. James Fredrick, ACA community engagement director, said it’s part of the concert association’s intention to serve every member of the community. “That doesn’t necessarily just mean ticket sales at the performing arts center,” Fredrick said. That afternoon, sitting in the audience in the gym, Corine Camille said the music carried her to a place outside the prison walls. When she listened, she said, she pictured a place far away. Sitting in the front frow, Kendria Huskey said the music gave her goosebumps. When Mahlasela sang, she said, she felt like he was delivering a deeper message. After Mahlasela performed, audience members had the chance to ask questions about his music, his work with Nelson Mandela’s 46664 campaign, his travels and his trip to Alaska. Listening to him was a blessing, Huskey said. From his perch on stage, Mahlasela could see the way the music affected the crowd, he said. Women danced in their seats. Men smiled and tapped their feet. Packing up his guitar after the show, Mahlasela called it a success.